and staff who are also members of ISU Credit Union." Cheatum, Marketing Manager of the ISU Credit Union. other credit union locations that the ISU Credit Union works with throughout the country to deposit money into their students' accounts. Pond Student Union Building this fall as well. At this branch, a newer service philosophy in the banking industry called "dialogue banking"
as reduce the chance for human error. "It's just a very easy way of doing your banking with the credit union," said Taylor. 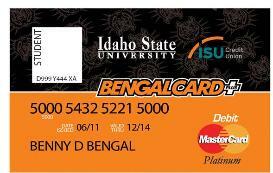 getting the BengalCard Plus will be quite simple. offer to members, "We're one of the lowest cost institutions in the area." has with the university. "It just made sense to enter into this program with the university," said Taylor. have with the ISU Credit Union. students, faculty and staff that use their BengalCard Plus." university which in turn helps everyone on campus.